The Web Based AJAX Enabled Query Tool (AEQ tool) is an educational software designed to simplify and enhance database related learning. The goals of this tool were to: (1) Provide students with an easy-to-use, remotely accessible database interface that seamlessly integrated access to multiple database clients (MSSQL, MySQL, Oracle). (2) Provide students with easy means for interaction outside of class through live chat and a shared working mode. (3) Provide instructors with an intuitive interface for organizing both class participants and also class materials. These goals could only be met through a combination of internet technologies. 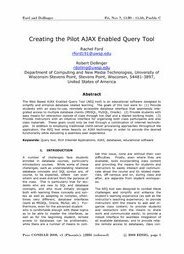 In addition to employing traditional client-server processing approaches throughout the application, the AEQ tool relies heavily on AJAX technology in order to provide the desired functionality while delivering a seamless user experience.